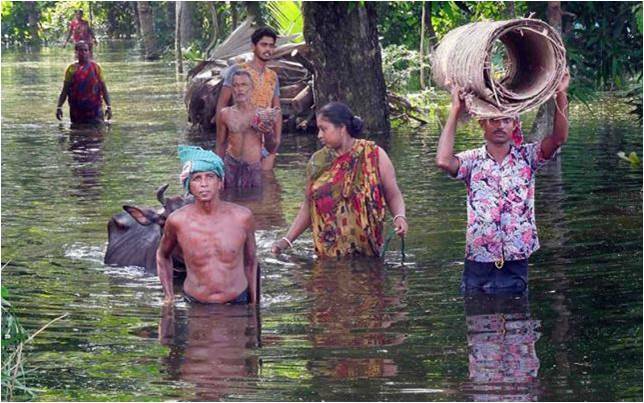 Devastating water logging in southern Bangladesh keeps at least one million people under water for years. Due to hydrological complexities, the problem, caused by structural interventions funded by ADB and USAID, remains unresolved. Due to three ill-planned structural interventions created by the Coastal Embankment Project (CEP), Khulna Coastal Embankment Rehabilitation Project (KCERP) and Khulna-Jessore Drainage Rehabilitation Project (KJDRP) Projects, prolonged and catastrophic water logging has been caused in three Upazillas of Jessore namely Manirampur, Keshabpur, and Abhaynagar. Siltation carried by the upstream water flow outside the embankments created by the Projects resulted in filling up of Hari, Teka, Mukteshwari and Upper Bhadra river. Simultaneously due to structural interventions and also closure of some of the sluice gates including one called Bhabodaho sluice gate in…., monsoon water could not come out of the area covered by the Projects. Both the factors together resulted in the devastating water logging in at least 144 villages of Abhaynagar, Keshabpur and Manirampur Upazillas that is continuing till October, 2005 causing indescribable sufferings for at least 3 lakhs villagers of the said three Upazillas. The affected villagers of the three Upazillas had no return from the agricultural activities since 2005 that remained their only source of income. A statement prepared by Upazilla Agricultural Officer showed that in the year 2005 alone, the amount of loss in the agricultural sectors in Keshabpur Upazilla has been Taka 6,30,40,000 as there was failure of ropa aman, vegetables, spices and other crops. According to a statement prepared by Upazila Nirbahi Office, Abhaynagar, in the Upazilla of Abhaynagar, the number of affected people were 20,000 with crop failure in around 3365 hectors of land. Another statistics showed that in the Manirampur Upazilla, an estimated 6012 hectors of land had crop failure due to inundation in the year 2005. In 2005, 1,16,600 hectors of land within the areas of the Projects went under water. As a result of successive crop failures due to the prolonged water logging, people faced with unbearable financial loss. Their lives and properties were severely and adversely affected and their social, economic, educational life have came to a complete halt. People were seen taking shelter on the embankments as their houses went under water. Their houses, cultivable lands, religious institutions, schools, colleges, kitchens, gardens, fisheries went under water and remained so from 2004-2006. In the absence of food and shelter, the sufferings of the aged, children and women were beyond description. Due to lack of support from the government, the affected people were in no position to meet even the minimum required to pull on with lives. There was no shelter, supply of food, livelihoods, and basic access to health and sanitation. The curse of water logging was judged as a classic example and evidence of failure of million-dollar loan projects implemented devoid of public participation and in non-transparent ways. Although peoples’ grievances were adequately reported and recorded, these was no effective measures from either the funding agencies and/or the government actors to remove water and protect peoples lives, livelihood, safety, health, comfort, environment. Project Details The districts of Jessore and Khulna situated at the south-western part of Bangladesh are affected by saline waters of the adjacent coastal water courses. During the decade of the 60s, under the CEP funded by the United States Agency for International Development (USAID), polders were created in/along the coastal region of the Country to protect the region from being flooded with saline water and bring more lands under cultivation. It is reported that under the CEP, 2000 miles long embankment, 780 sluice gates and 92 polders were constructed effectively enclosing most of the tidal wetlands within high embankments. Of the 92 polders of CEP, 16 polders are in the Khulna, Jessore and Satkhhira districts including polders 24 and 25 which are in Jessore. Within a few years the negative impact of the CEP started becoming evident with the biodiversity of the region being degraded, river flows adversely affected and many rivers being silted up affecting navigation and the seasonal migration of fish and other aquatic fauna. Since the early 80s, some areas of the region started evidencing water logging (commonly known as the water logging of Beel Dakatia) as a result of the CEP structural intervention that today has increased in volume and magnitude due to other subsequent unplanned and ill thought projects and instead of being solved permanently is merely shifting from one place of the region to the other. Another Project called the KCERP funded by Asian Development Bank (ADB) was implemented between 1986 and 1993 with a loan of $ 16.9 million (Loan 819-BAN (SF). Although it is claimed that the CEP and the KCERP saved 400,000 hactors of agricultural land from salt water intrusion caused by daily tidal flows and drainage congestion during monsoons, a report of the ADB has in clear terms admitted that both the CEP and the KCERP caused catastrophic drainage congestion in different areas of Khulna and Jessore due to silting in the river channels and low areas outside the polders, and along the sluice gates. 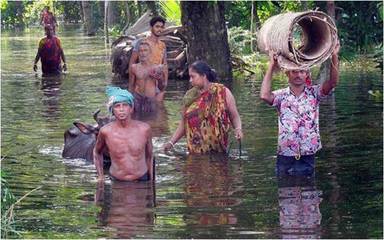 By 1990 over a hundred thousand hectares of land in Khulna, Jessore and Satkhira became waterlogged, and agriculture became impossible. A vast area of crop land remained under water for more than 13 years with villages submerged and collapse of houses and semi-urban and rural infrastructure. Today areas within polder Nos. 24 and 25 comprising Beel Bakar, Beel Bhaina, Beel Kedaria and Beel Dakatia in the district of Jessore are witnessing perhaps the worst water logging of the century ever experienced anywhere in any part of the world. The ill-planned and unsound interventions with the natural flow of rivers and other water bodies, the structural interventions of CEP and KCERP exposed the project areas to siltation and drainage congestion. Over the years the situation deteriorated and in the absence of any appropriate intervention from the government actors, the situation took severe form resulting to long-lasting water logging of vast areas inflicting indescribable sufferings for the local people and causing catastrophic damages and losses to their properties, lives, livelihoods, safety, comfort and well-being. The problem of water logging/drainage congestion in some part of the project area due to the faulty design and implementation of the CEP and the KCERP became so acute that a separate Project called the KJDRP was drawn up and partly funded by Asian Development Bank (ADB) for an amount of $ 32.65 million (equivalent to 252 crores Bangladeshi taka). This project was implemented between 1993 and 2003 by BWDB as the lead agency with support from the Agricultural Extension Department and the Department of Fisheries having the primary objective of rehabilitating the drainage infrastructure to reduce drainage congestion, and protect the project area from tidal and seasonal flooding. KJDRP claiming to have sustainability of 25 years covered 100,600 (one lac six hundred) hectares of land spread over 68 unions under eight Upazillas of the district of Khulna and Jessore including Abhaynagar, Monirampur, Keshabpur and Jessore Sadar under Jessore district and Batiaghata, Daulatpur, Dumuria and Phultola under Khulna district. The project area comprised the area surrounded by the river systems of Hari River, Teka River, Southern River, and Upper Bhadra River Systems of the Shibsa Basin. According to the Project Completion Report of the ADB the main Drainage Rehabilitation Component of the KJDRP had provisions for excavation of primary and secondary drainage networks, dredging the river channels, improving the drainage regulators and embankment system, and strengthening the communication network within the area. The project achieved the appraisal target for the rehabilitation work by dredging 1.6 million cubic meters of river and 11.13 mcm of drainage channels, establishing 2 closures in Beel Bhaina, 5 cross dams in upper Bhadra River, and 1 river closure at Ramdia and undertaking emergency dredging works totaling 7.8 km with members of the Labour Contracting Societies (LCSs) dredging 22.5 km. Development of Alternatives The structural solutions offered by the KJDRP miserably failed to address the issue of water logging/drainage congestion of the project area. On the contrary, the situation got worsened and vast land of the project area covered under polder 24 comprising 27 beels (large depression area) and at least 144 villages in the Abhaynagar, Keshabpur and Monirampur Upazilla started experiencing unprecedented water logging for indefinite period as natural drainage channels got silted and the sluice gates set up under the projects lost efficacy due to increased siltation and evidently no effective dredging. In 1997, local people introduced a process called Tidal River Management (TRM) and tested the same in Keshabpur under Jessore. Under TRM approach, tidal water enters only in one tidal basin developed in a suitable beel with dykes and closures and deposits huge amount of silt that fills the bed of the beel in 3-4 years. They removed embankment encircling the Beel Bhaina in Keshabpur to allow tidal flow of water into the beel area. The TRM introduced by local people significantly reduced the water logging problem in Keshabpur and helped raising the land level of the beel with siltation. This approach enhanced the scope for mitigating drainage congestion and people recommended that new TRM should be established every 3-4 years on a rotating basis to ensure that water congestion of all areas are resolved by raising level of beel areas through sedimentation. Unfortunately, adamant position of BWDB against interference with existing structures and absence of firm commitment from the government agencies to pay compensation to land owners whose lands shall be under water for at least three years to allow TRM led to no agreements on TRM in new areas including in beel Khukshia, Kapalia and Baruna. As water logging took a severe form in 2005, local people started writing to the government actors to remove water from their villages, homestead, academic institutions, roads and all other infrastructure and also to protect their lives, properties, safety and health from the curse of such water logging attributable solely due to the unplanned structural interventions of KJDRP and other previous projects. They also appealed to the government to compensate them for the financial loss sustained due to the waterlogging. 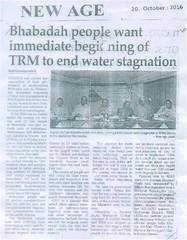 The demands from the people were considered in a meeting on 25.11.2005 that in the presence of three concerned members of Parliament decided that the situation would be handled on an emergency basis like war situation and that siltation from Sree-Hari-Teka rivers would be removed to drain out water to enable people to cultivate boro crop. Unfortunately, the situation was not handled as promised and people, having not received any effective and adequate administrative reliefs, under the banner of Progoti Samajkallyan Sangstha (Progress Social Welfare Agency) approached two national level NGOs on 04-04-2006 to take their grievances to the High Court. A Public Interest Litigation was filed by two NGOs in the form of Writ Petition (No. 7123 of 2006). The Court on 13-08-2006 directed the government actors to provide all services, products, goods and supports required to ensure that that the affected villagers are safely located and are receiving food, water, medicine and other essentials during the period of water loggings. The Court also directed pumping out of water from the affected villages for ensuring recession of water logging. The High Court also required the government to show cause as to why they shall not be directed to form an appropriate committee to permanently solve the problem of water logging in the three Upazillas of Keshabpur, Manirampur, and Abhaynagar. Why? Explain briefly. 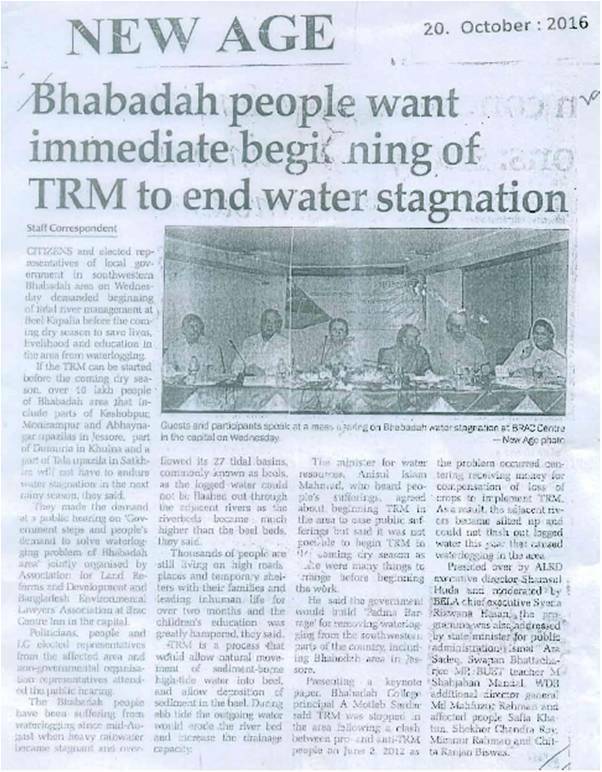 Although the High Court Division gave a set of interim orders and the government took initiative for TRM in some of the beels, the initiative stopped as the local people demanded compensation for TRM that keep their lands under water for a certain period of time and hence render the same unproductive. The water logging situation aggravated in the years 2008, 2014 and 2016 and people are yet to be freed permanently from the same.